Causeview Impact Designer is our new form and landing page builder. 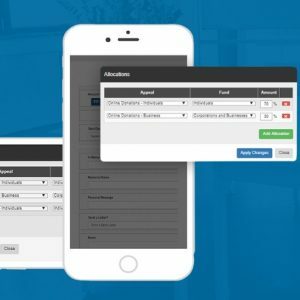 It lets you create custom, fully responsive designs for your organization’s online donation forms, contact us pages, and landing pages to host the forms. It’s simple to setup as many designs as you require, and the powerful functionality will help you drive results. To learn about everything you can do with Causeview Impact Designer, click here. One-Time vs. Recurring Amounts: Suggested gift amounts can automatically change based on the gift type selected by the donor. This allows you to show smaller amounts to those making a recurring gift, and higher amounts to those making a single donation. Processing Fee: Allow constituents to cover transaction fees through a custom percentage set by your organization. Dynamic Fund or Appeal Selection: Allow donors to select the fund or appeal they wish to allocate their gift towards. This encourages supporters to complete their donation by directing their funds to the area or project they are most passionate about. Multi-Currency Selection:For organizations setup to process multiple currencies, you can offer donors the choice to define the currency that they will be charged in. Google reCAPTCHA (Static/Based On Minimum Amount): You can now set a minimum donation threshold, where donations of a lower value will trigger the reCAPTCHA fraud protection feature to appear. You can still choose to have the reCAPTCHA appear for each gift, regardless of the amount. Set Data-List Default: Previously, to change the default value you had to make a copy of a data list. You can now update the default value to select or show from a pick-list. For example, you can set the “Country” field to default to “United States” on one form and to “Canada” on another using the same data list. Conditional Visibility: Set a field or other content to appear only if a condition is met. If you’re a Causeview user who wishes to enable Impact Designer for your organization, click here.